The radio sky is full of giant loops and elongated features which have been known since the earliest days of radio astronomy. Using data from the WMAP satellite and reprocessed classic maps of the sky, a team of astronomers at Jodrell Bank suggest these loops may be produced by a nearby expanding shell driven by supernova explosions and the radiation from massive stars. The study of the diffuse Galactic radio emission is nearly as old as radio-astronomy. The first extraterrestrial radio signal detected by Karl [Guth] Jansky in the early 1930s originated from the central region of our Galaxy. Later, in the 1950s, maps covering much of the sky were made which showed large elongated features and loops. Various different hypotheses for the origin of these structures are still being discussed today. The emission from the loops is produced by synchrotron radiation, where highly energetic electrons travel spiralling around magnetic field lines at almost the speed of light. The famous 408 MHz map of the radio sky published by Haslam et al (1982). This version has been reprocessed by Remazeilles et al (2014). 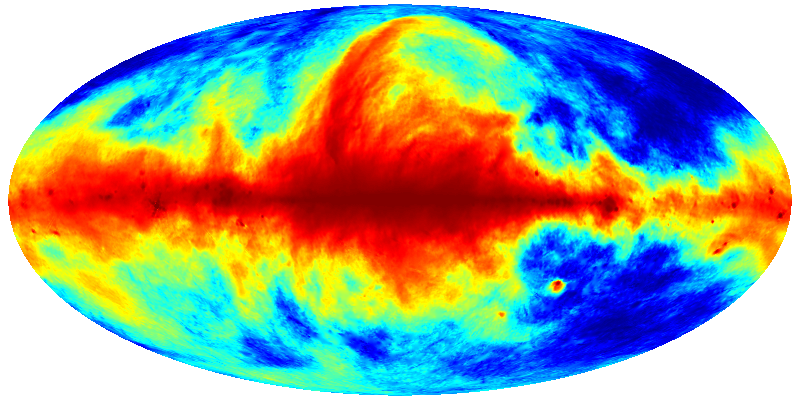 In 1982, Glyn Haslam and colleagues presented a full sky map at a radio frequency of 408 MHz. The map had taken more than a decade to produce and combined data from the Jodrell Bank, Effelsberg and Parkes radio telescopes. This is the most widely used synchrotron template of the sky. In this map, four Loops are visible but they are difficult to isolate from a smooth diffuse component. Now, using data available from the WMAP satellite, we can see for the first time how the polarised radio sky looks at high radio frequencies (~30 GHz). Surprisingly, the sky is covered by a number of bright filaments, without the uniform smooth background which dominates the radio continuum maps. We have catalogued these new filaments and tested a model to explain the origin of some of these features. We believe that they might be caused by the interaction between an expanding shell in the solar vicinity with the magnetic field of the Galaxy. The expanding shell, powered by supernova events and the radiation from massive stars compresses the magnetic field around it, increasing the synchrotron emission from the shell. This simple model reproduces well the data in most of the areas studied.